A piano note resounds. A little as congealed in time, it hooks its brilliance onto azure colored synth lines which undulate like filaments that we push from the fingertips. "Xterminator 17" hangs onto our ears with a weeping synth which shows as much gloom as this piano and its forsaken note in the slow caresses of synth layers with perfumes of a big tenebrous organ. Two minutes later, the introductory atmospheres of "Xterminator 17" are exchanging this envelope filled with melancholy for an approach of boom-boom-klang-klang. The tone is given! We comprehend of what will be made “Accelerator”. Except that we won't surf in simplistic atmospheres of techno. The hammering of the bass pulsations and of the percussions are boosting sequences which flicker like two bees in front of the attack of a big bear, while other effects of percussions and voices as well as jerks of violin worthy of the good disco moments of the 70's, voices of astronauts and good electronic effects decorate the semi-lively rhythm of "Xterminator 17" of electronic elements and cinematographic orchestrations which will differentiate it from those albums of this genre. The fans of EM were very curious in front of this collaboration between Wolfgang Barkowski and Stan Dart; an artist who is rather recognized to make Electronica and Chill with the concept of Cinematic Electronic Chill Art. 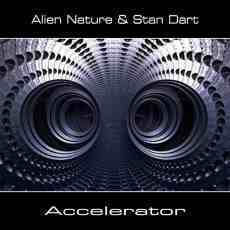 What will this fusion between the cosmic electronic rock of Alien Nature, from whom the superb The Airlight Garage of Jerry Cornelius had brought Wolfgang Barkowski to another level, and the Electronica beats from Stan Dart? Well the result is a fascinating mixture between two universes which respect themselves mutually. Structured in a sound mosaic of 80 minutes filled with explosive rhythms, at times ambient and other times very lively, scattered in 10 tracks which bind their structures of cosmic dance in a long continuous fresco, “Accelerator” is a pleasant surprise filled with things which will haunt our ears and make us addict for many hours to come. There are great electronic tunes, sculptured in good movements of sequences, which haunt both ears here and good robotics rhythms which hammer their imprints in our brain where the synth-pop of the 70's and the 80's, the Chill moods, the morphic techno and the electronic rock have never go so good together. "Chrome" is a nice example where a staggering sneaky walking adopts gradually the coat of arms of the synth-pop. The robotics percussions of the 70's are as well pleasant as unexpected and force a bouncing rhythm. A kind of hip-hop wrapped up in twisted solos of a sinuous synth which are very present in this album. Solos or harmonies, sometimes plaintive otherwise shrill and also very vaporous, that a piano decorates with a melody as melancholic than these tears of synth. The whole set continues up to the doors of "Am Morgen" which proposes a long ambiospherical structure where the keyboard gathers its chords in order to propose an interesting duel with some pulsating sequences. The rhythm becomes heavy with momentums of percussions of which the brief jerky attacks bicker with effects of hands bangings and with those chords which became a thin line of sequences which sparkle sharply in a dead end structure of rhythm. "Evening Lights" adopts a little the same pattern than "Xterminator 17", the structure here is as much rich and lively, except that the rhythm is more electronic, more fluid, less minimalist and maybe wilder. This is very good! That makes the blood running in our feet. The atmospheres of "Ambios 1" guide us to "Sleeping Madness"; a strong track, a very technoïd one which is compacted by good electronic effects. That does very Jarre! The rhythm is heavy, curt and hopping with beautiful variance which enrich a harmonious approach that will make vibrate our ears. But not as much as with "The Grind" which is going to sink sequenced melody deep inside your ears. A melody which is going to roll in loops all day long in your head. Simplistic with 8 sequenced chords which float lightly in a rich cosmic envelope, the melody is supported by solid orchestrations. This rhythm evaporates its robot-like and technoïd atmospheres in an approach of trance collective of some hot and humid dance floors. It's a little jewel of obsession! It sounds like some Moonbooter at his best and at his heaviest. After the small ambiocosmic bridge of "Ambios 2", "The Heist" takes back a structure of breakneck pace with a sharp pulsatory movement to where are grafted percussions hammered on soft wood and rosaries of sequences which describe stroboscopic thin lines. This kind of mixture between the music of dance and the techno reminds me the structures of Visage in its eponym album as well as those of Jarre in Teo and Tea, but in a clearly stronger vision. "Requiem" concludes “Accelerator” with a theatrical approach which develops in the course of its minutes into a good symphonic e-rock. A piano and a keyboard are switching melancholic chords in the opening, weaving a dark melody which little by little swaps its mortuary moods for a rhythm which grows gradually in smooth orchestral cuddles in order to reach a slow staccato caressed by the calm strokes of violins, pierced by very intrusive synth solos and transported by deafening booms-booms. It's the signature of “Accelerator”!